More protection and lighter weight, the AG44 from Chicago Protective is their most comfortable PP4 arc flash suit. Constructed with Tri-Blend inherently FR fabric, these suits are strong, durable, and comfortable to wear. 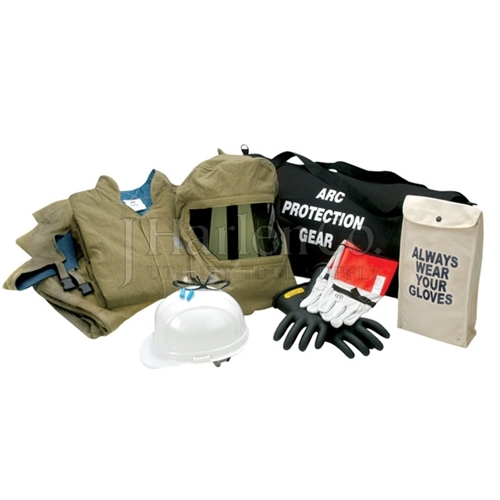 This kit includes: jacket, bib overall, hood, hard cap, rubber gloves, leather glove protectors, glove bag, gear bag, safety glasses, and ear plugs. Rubber gloves – class 2 rubber gloves are proof tested to 20kV and have a maximum use voltage of 17kV. The leather glove protectors included feature a wrist adjustment strap and 12” cuff. Glove sizes: Small (size 9), Medium (size 9-1/2), Large (size 10), and X-large (size 10-1/2).